A fundraiser is walking from London to France to commemorate the 90th anniversary of the Battle of the Somme. After a service at West Brompton Cemetery, west London, on Wednesday, Ian Squire set off to Ovillers Military Cemetery in northern France. He will arrive on 1 July for a ceremony marking the first day of the battle in which thousands of soldiers died. Funds from the Great War Walk will go to the Shooting Star Hospice for terminally ill children in London. 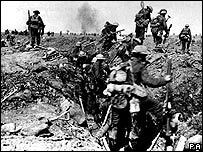 The 1916 Battle of the Somme was one of the largest battles of World War I, with more than one million casualties. The Allied forces attempted to break through the German lines along a 25-mile (40km) front north and south of the River Somme in northern France. It is remembered for its first day when the British suffered 57,470 casualties, including 19,240 who died.